At the risk of annoying readers who might be motivated to obtain this [of course] limited edition cassette release, only to discover it’s sold out, a few words. It is stunning, and not, happily, for reasons I can easily identify for you. 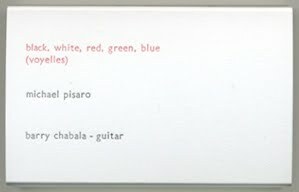 Composer Pisaro is a 2008 discovery for me, guitarist Chabala an almost simultaneous one. I had heard several of Chabala’s solo and duo recordings before he and Pisaro became nearly symbiotic collaborators. His early improvised work was promising to me, a little tentative and sketchy-sounding, but clearly foreshadowing the confident strokes he has achieved in his interpretations of Pisaro’s structures. First with Pisaro’s An Unrhymed Chord [for 25 acoustic guitars], and most recently with black, white, red, green, blue/(voyelles), Chabala has found a simpatico sensibility, remarkably so. With the former piece, Pisaro provides an outline of parameters, chiefly time constraints, for whatever sounds Chabala chooses to make, a dyad is formed, and it sounds seamless. In black, white, red, green, blue/(voyelles), the music is stripped of whatever symbology and valences Rimbaud intended in the sonnet from which Pisaro derives his title and inspiration. What remains is a long, luminous suspension of time, with Chabala’s guitar notes placed with great care and regard for subtle changes in timbre and duration. (voyelles) uses the Chabala recitation as a basis track, and Pisaro adds, with a light and apposite touch, sine tones and clouds of sampled cassette tape hiss. This last description isn’t going to give you the sound picture, you’re going to have to hear it. I have, probably more than anything else I have listened to since I got it, and it continues to serve up surprises and sweet illusions, especially as regards the treatment of time and the possibilities in the reiterations of Chabala’s spare guitar notes- how do these two collaborators, given the latitude a Pisaro piece provides, pull off this sort of meld? ErstDist still has copies . You can also try the Winds Measure label or contact Chabala himself to see if any copies remain. This pointer to what is, very early in a new year, one of my favorite releases thus far, was not to frustrate, but to alert you to a partnership I will watch with great interest in the coming year. And there is always the option of clamoring for a re-release, on CD; sometimes we listeners should raise hell at the growing trend of really limited releases that, like this one, merit time to be carried by word of mouth to your permanent library. This entry was posted in music writing on March 1, 2010 by jessewgoin. Ha, didn't know the source of the titles, excellent. fwiw, so far this young year, the voyelles, along with the Tilbury/Smith Quartet DVD of Feldman, is also my favorite release. I still have a bunch of copies of this one too at ErstDist. I added a link to erstdist for seekers of the Pisaro/Chabala release.